And the Mexican doctor says, “You’ve got an eye infection and you’re not going to be able to scuba, swim or even touch water… Probably for your entire trip.” We’ve been in Cabo for 12 hours and a poorly timed eye infection threatened to reshape my trip before my wounded eyes. This trip was going to be interesting in more ways than I expected. Brian and I flew down to join the boat from Cabo San Lucas through the sea of Cortez to mainland Mexico. 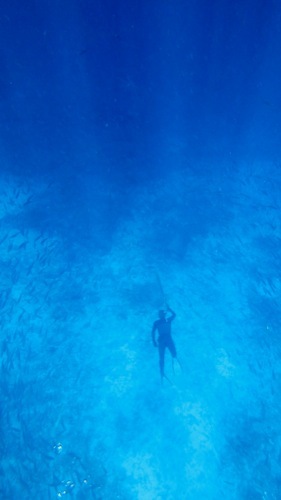 We came for the famed warm clear waters and noted spearfishing. How often do you get to watch your friends take a trip of a lifetime with your support and then climb aboard?! Brian caught lunch. And dinner. And making a good candidate for the “Men of Aldebaran” calendar…..
As we left Cabo San Lucas, the decidedly American beats wafting from the flotilla of party boats subsided and we soon entered what is the real norm for Baja Sur: quiet, desolate, uninhabited, and beautiful coastline. Michael and Eric enjoy the beaches of Cabo Pulmo National Park right after hearing Eric was cleared to dive. 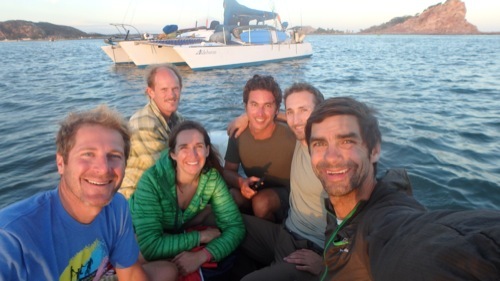 Our days simplified immediately around boat tasks, chasing adventures, and preparing the next meal. My days simplified around eyedrops every three hours and encouraging our divers from the deck. Having a painful event like this forced me to reset my priorities and ask myself… What do we have without health, how would I deal with adversity? The resounding answer I came to was asking myself was striking balance and cultivating community are everything. I had simply been too busy in my life to be fully healthy, and was only through the grace of our amazing group of friends that I was able to find care and be nursed back to health. I’m indebted to them for being so loving and supportive and everything looks bleak through the one eye I could use. They even dressed me up as a pirate so my handicap could bring laughter! The idea of crowdsourcing real adventure is a fresh concept to me. In a world where it seems like there are 100 television programs about chasing your dreams and adventure, we all seem to have but two weeks a year to find it for ourselves. The Green Coconut Run on the Aldebaran is a living example of chasing a big dream that we can all jump aboard. It inspires me and I hope many more people feel the desire to bite off something just slightly uncomfortable in scope. I found myself dreaming bigger because they did. So.. Back to my eye. We had a minor engine issue that forced us to anchor for a day. I managed to take the skiff Lunabel to shore with Michael. 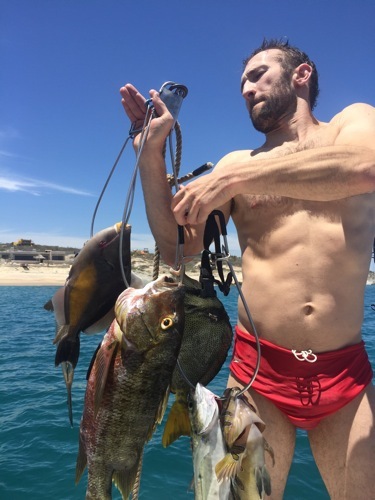 After consulting the local fishermen we found the one spot on the deserted beach in the middle of nowhere that could connect a call to my doctor in Cabo. After solid discussion he agreed my progress could allow me back in the water in two days. This was a magical moment, and in the next week of diving didn’t disappoint as we visited island after island and watched an aquarium of beauty swam around us. I shot very few fish overall because we didn’t need to more and no dorado graced us with their colorful presence. Isla Espiritu Santu was like the landscape of the American Southwest meets a calm, tropical sea. As our last dive came to a close we sailed away from a scorching red sunset into night where winds pushed us across the Cortez. 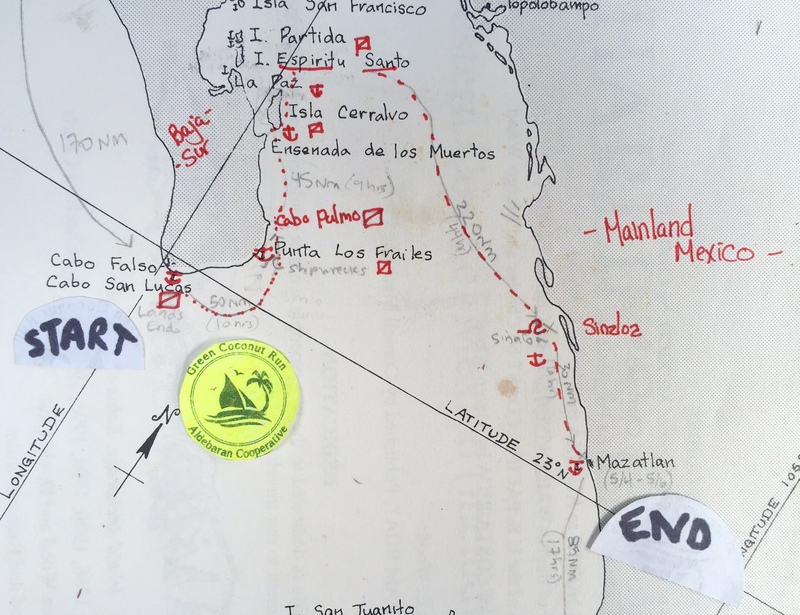 38 hours later found us in the massive swell the plowed into Sinaloa and tricky waves to navigate on boat and boards. We finished our leg with a dinner in Mazatlan laughing over beers as I got to see a friend from high school living in Mazatlan. 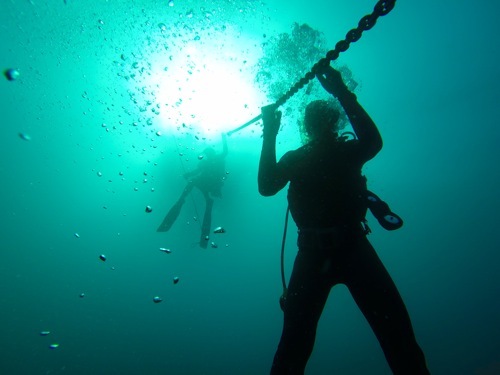 Diving the chain to the El Bajo Seamount, 7 miles out in the middle of the ocean. I’m back in the States now, and my eye is fine. I reflect often about the places we visited and how magical that experience was. I’m thinking about adventure more and more now… And what my version might look like. The boat sails on and I’ll continue to follow them online. I feel lucky to have had a taste of what the next generation of adventurers are exploring with healthy happy eyes wide open. Impressive. Good on ya, Eric! 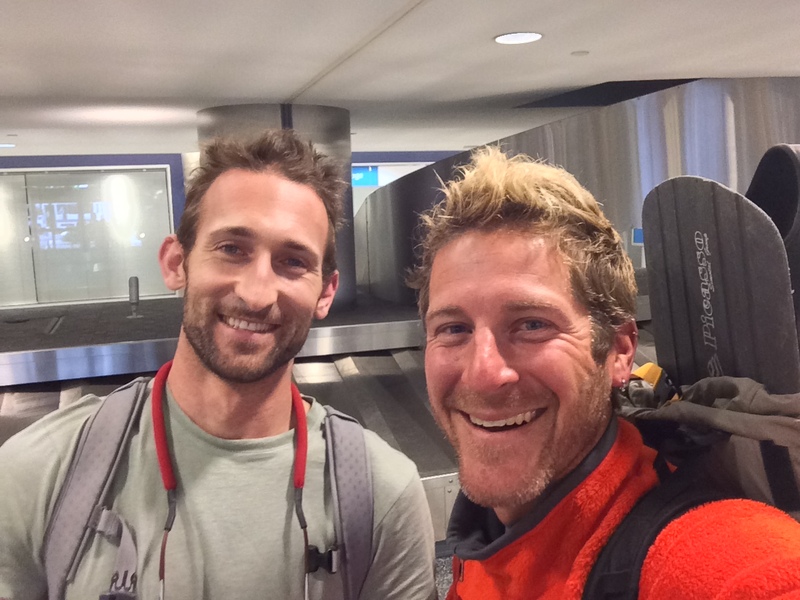 Great adventure, you are a true inspiration………….love it all. Wonderful pictures, Eric.